Boys Club logo created from a national contest held in 1978. "Club programs and services promote and enhance the development of boys and girls by instilling a sense of competence, usefulness, belonging and influence." The first Boys' Club was founded in 1860 in Hartford, Connecticut, by three women, Elizabeth Hamersley and sisters Mary and Alice Goodwin. In 1906, 53 independent Boys' Clubs came together in Boston to form a national organization, the Federated Boys' Clubs. In 1931, the organization renamed itself Boys' Clubs of America, and in 1990, to Boys & Girls Clubs of America. As of 2010, there are over 4,000 autonomous local clubs, which are affiliates of the national organization. In total these clubs serve more than four million boys and girls. Clubs can be found in all 50 states as well as locations in Puerto Rico, the Virgin Islands, and US military bases. In total, Boys & Girls Clubs of America employ about 50,000 staff members. The Chronicle of Philanthropy ranked Boys & Girls Clubs of America number one among youth organizations for the 13th consecutive year, and number 12 among all nonprofit organizations. The Boys & Girls Clubs of America is the official charity of Major League Baseball. Denzel Washington, a former club member, has been the spokesperson for Boys & Girls Clubs of America since 1993. Following the success of the film Black Panther, Disney donated $1 million to Boys & Girls Clubs of America for the development of STEM programs in the United States. The donation will be allocated to help grow the group's national STEM (Science, Technology, Engineering and Mathematics) curriculum. It will also help in establishing new STEM centers of innovations in various communities that will include Atlanta, Baltimore, Chicago, New York City's Harlem, Hartford, Memphis, New Orleans, Orlando, Philadelphia, Washington, Watts in Los Angeles, and Oakland. According to Mimi LeClair, President and CEO of Boys and Girls Clubs of Chicago, it is very important for young people to have a solid background in STEM to compete in the global economy. ^ "Mad._Sq_AR_FINAL_reference.pdf" (PDF). Boys & Girls Clubs- Madison Square. March 17, 2014. Archived from the original (PDF) on October 29, 2013. Retrieved April 29, 2014. 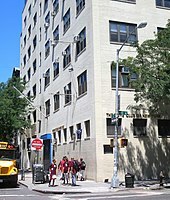 ^ "Home - Madison Square Boys & Girls Club" (PDF). Madison Square Boys & Girls Club. March 17, 2014. Archived from the original (PDF) on July 6, 2010. Retrieved April 19, 2014. ^ Kofi, Lomotey (2010). Encyclopedia of African-American Education. Greenwood Publishing Group. p. 111. ISBN 9781412940504. ^ Boys & Girls Clubs of America, Boys & Girls Club Leadership University. "COREv2: History of the Boys & Girls Club." ^ "MLB Community: Programs: Boys and Girls Clubs of America". MLB Advanced Media, L.P. June 19, 2012. Retrieved April 19, 2014. ^ "Title 36 -- Patriotic Societies and Observances". US Congress. May 11, 1994. Archived from the original on July 23, 2012. Retrieved April 19, 2014 – via resource.org. ^ "Evander Holyfield". Alumni Hall of Fame. Boys & Girls Club of America. Archived from the original on December 30, 2014. Retrieved March 17, 2015. ^ Gibbs, Alexandra (February 27, 2018). "In honor of 'Black Panther' success, Disney donates $1 million to Boys & Girls Clubs of America for development of STEM program". CNBC. Retrieved February 28, 2018. ^ "Donations will help establishing STEM centers of innovation in various communities". Mail Online. Retrieved February 28, 2018. ^ "Solid STEM background is important for youth to compete in the global economy". ABC7 Chicago. February 26, 2018. Retrieved February 28, 2018.